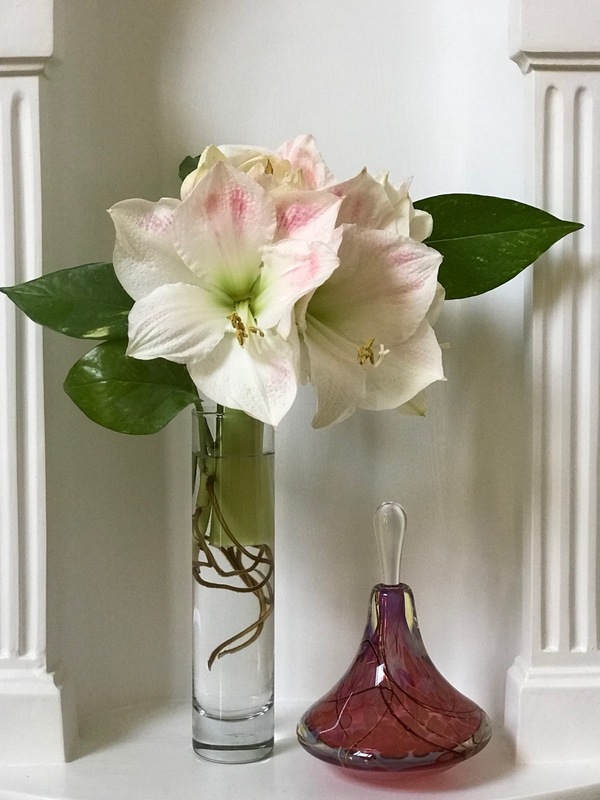 Two of my sisters visited during Thanksgiving weekend to help celebrate my husband’s birthday and I was thrilled to receive a gift of my own—this amazing amaryllis Cindy grew. A dwarf hybrid, whose name is forgotten, came planted in a charming white tin bucket and already displaying 4 open blooms on one stalk. A fifth flower has since opened. Unfortunately I forgot to take a photograph before cutting the flowering stem to allow it to condition in water overnight. 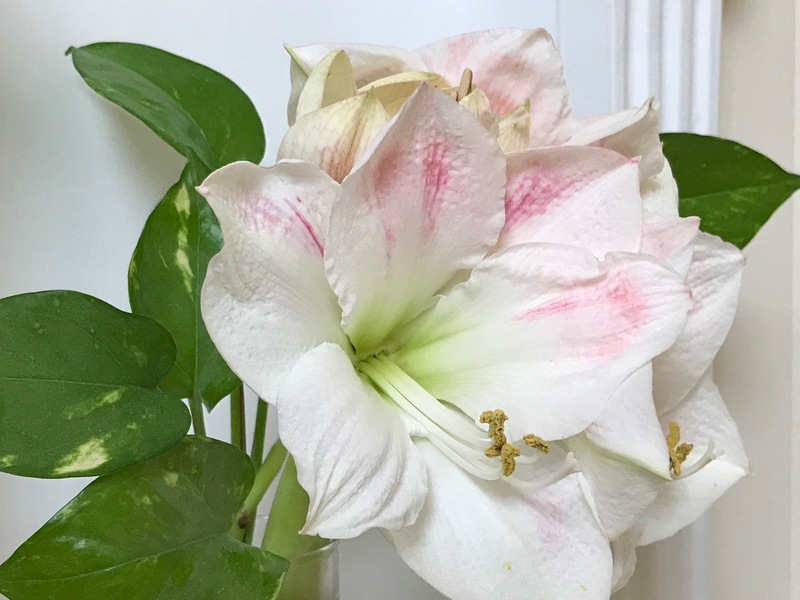 I read the hippeastrum should last two weeks as a cut flower or ten days left attached to the bulb. There is a second stalk growing from the bulb as well. 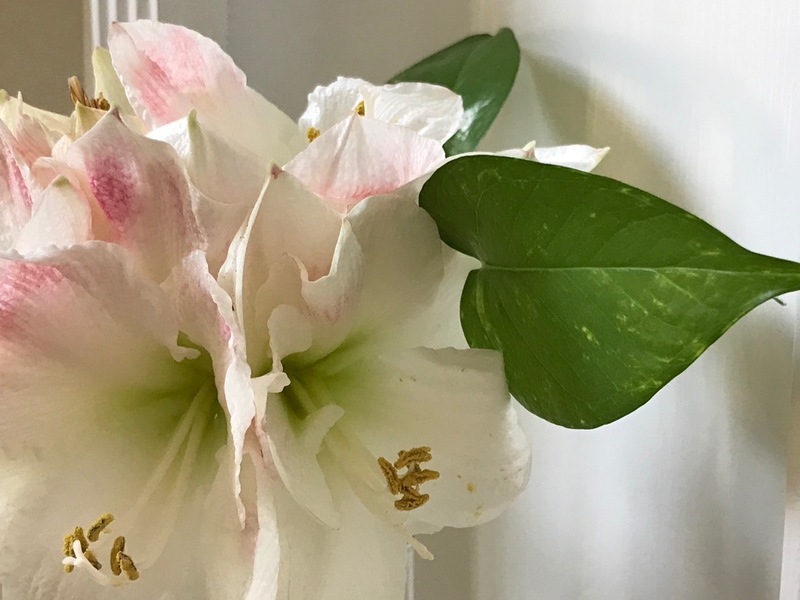 Though buds are not visible yet on the second one, perhaps this amaryllis will make its way into a future Monday vase. The tops of these flowers exhibit white petals smudged with pink, while the lower petals are pure white. Centers are a rich lime green. Variegated, heart-shaped leaves gently frame today’s flowers. I enjoy the way the philodendron roots serve here to add both weight and movement to the bottom half of the bud vase. 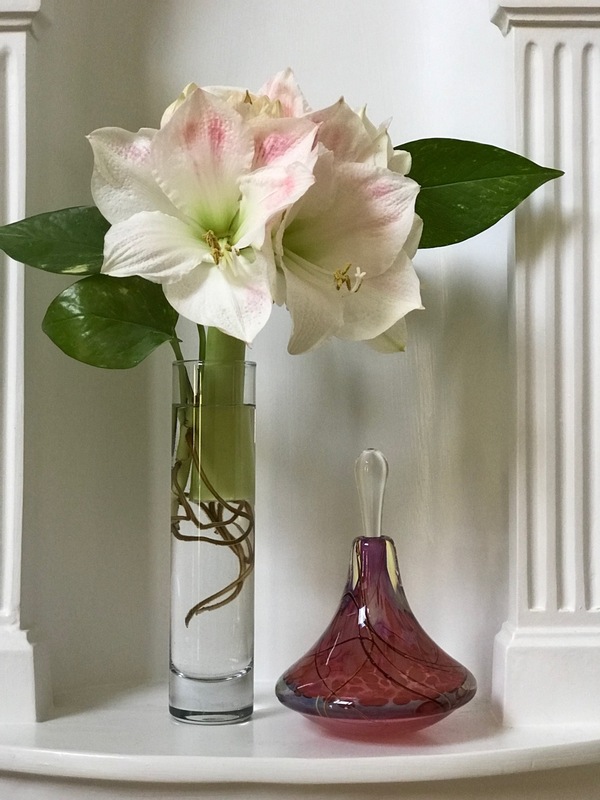 Before settling on this clear vase I tried several options, including a pink hand-blown perfume bottle. 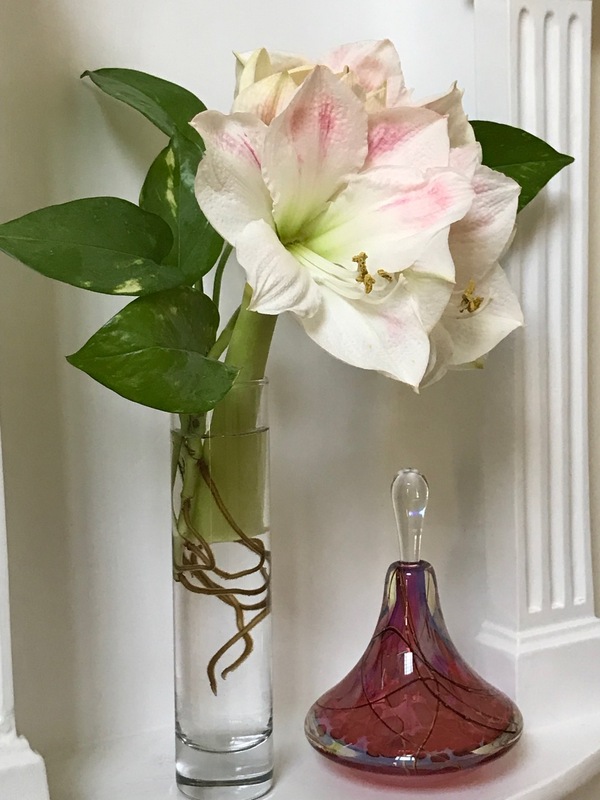 The amaryllis stalk was much too thick, but I kept the bottle as a companion. The lines in the bottle pick up the floating curves of the philodendron roots. 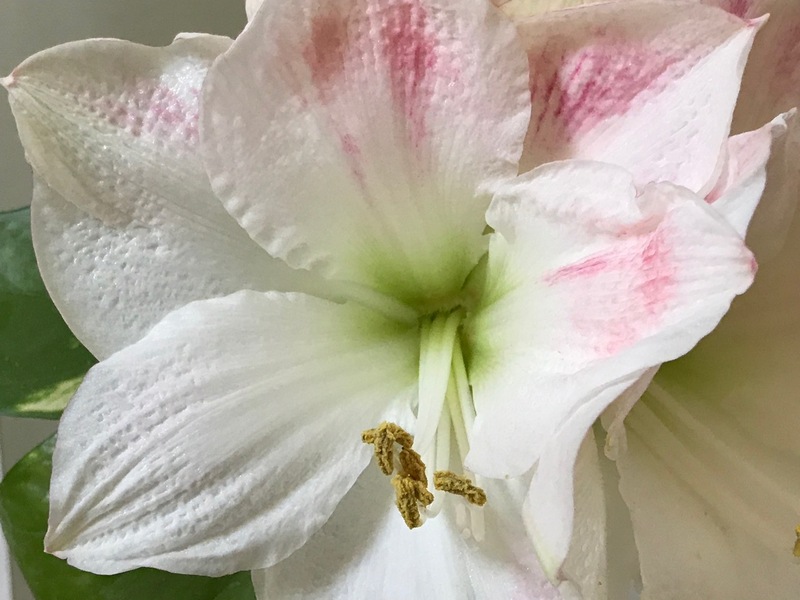 This entry was posted in garden and tagged 2018vase, Hippeastrum (Amaryllis), in a vase on monday, philodendrum on November 26, 2018 by pbmgarden.